most of this year, ably organised by Elizabeth. She writes more about it here! but I sure had a great time doing it! Trust me, it's not that bad in real life! It turned out so well, Suz! 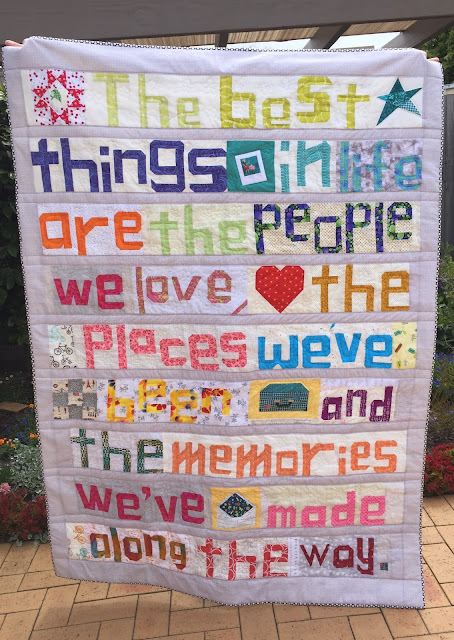 I love how your quilting matches the intent of the quilt's message - to enjoy life and make memories (rather than stress over if the quilting's perfect). 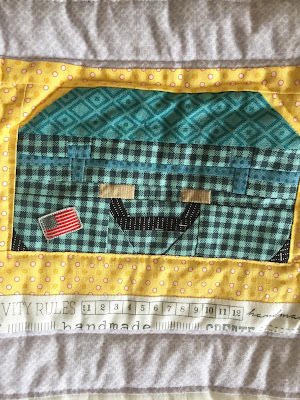 It looks fantastic to me and I bet you will always smile whenever you see this quilt. I love it! It turned out beautifully! I love it! What a really special and unique quilt! 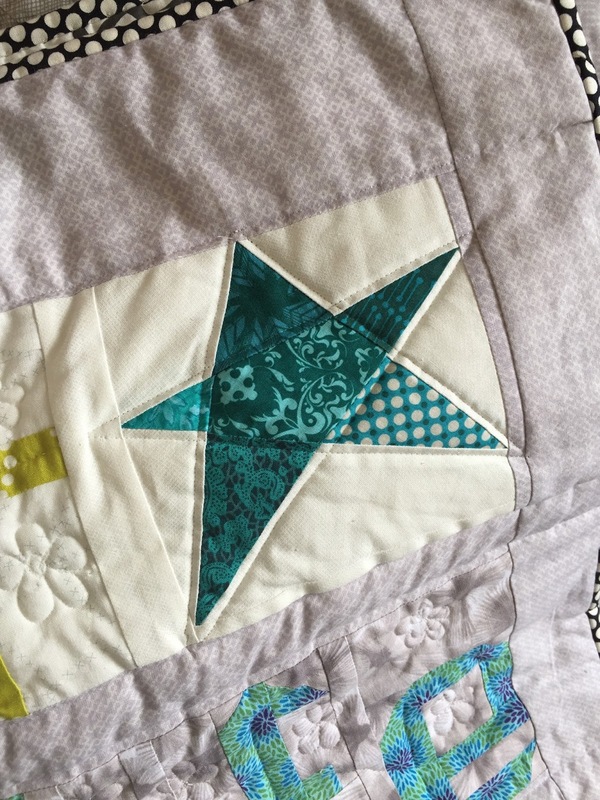 I think your quilting is whimsical and fun like the quilt top--good finish!! 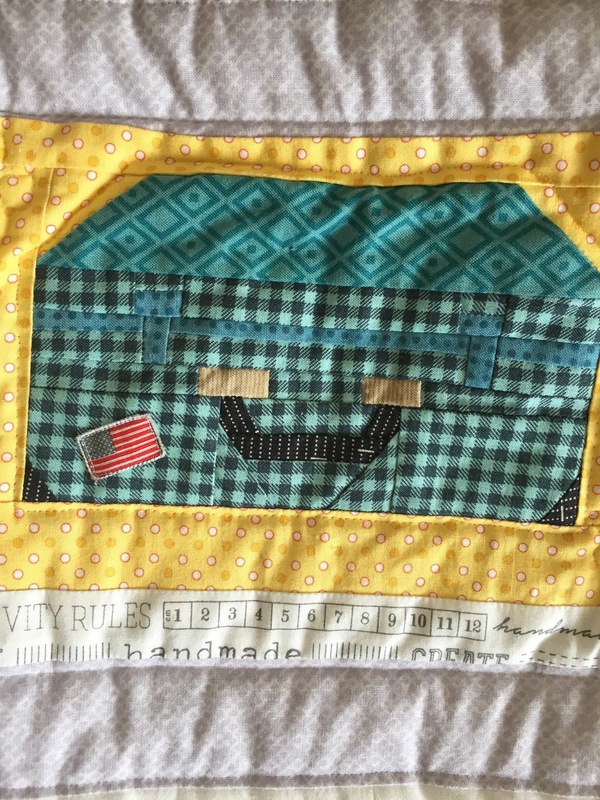 Don't belittle your quilting, Susan! It looks wonderful, and if you had a good time doing it, even better! 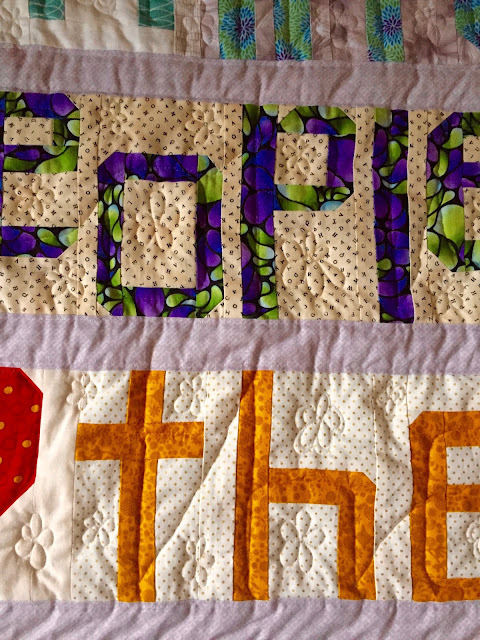 I think this is one of the best quilts you've made. The saying you picked out is perfect. How wonderful to have another finish. You're on a roll, for sure, and won't have anything left to sew and finish at the rate you're going! Looks to me like you have got fmq sorted, it's great! A very special quilt! 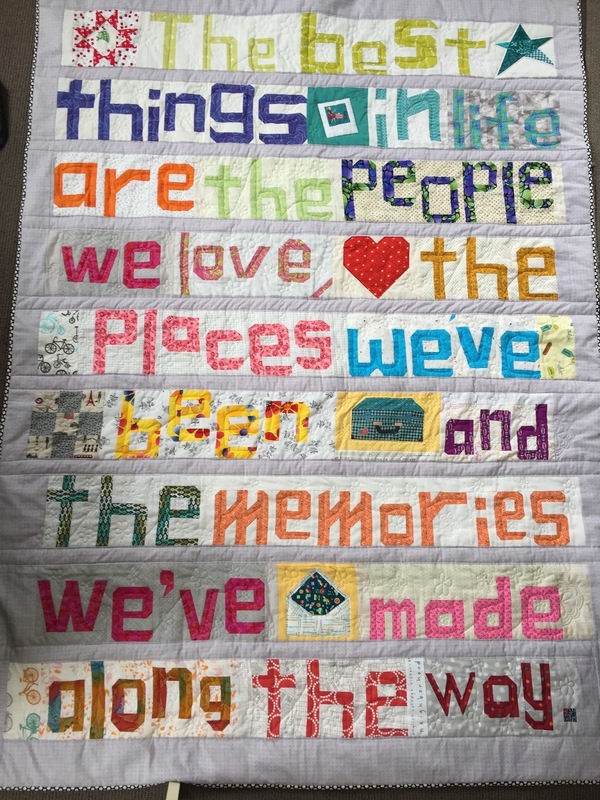 Beautiful quilt - really love the little blocks amongst the words! I love the floral quilting. This quilt needed something organic to go with the irregularly shaped letters. Nice choice! This is wonderful. 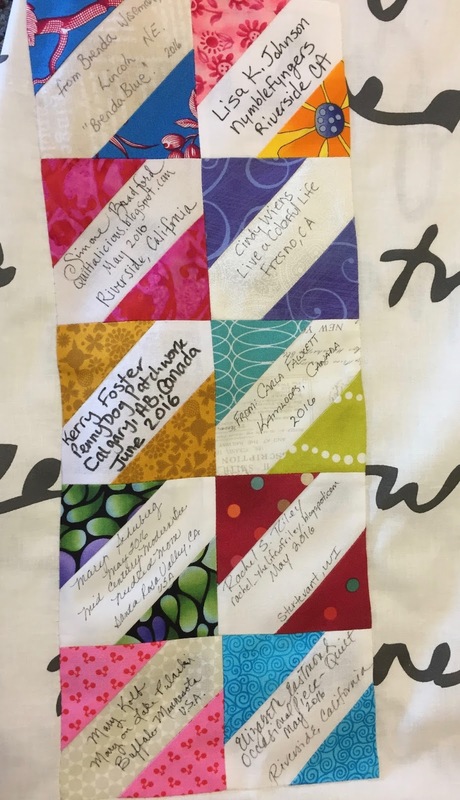 What a great finish on your quilt. 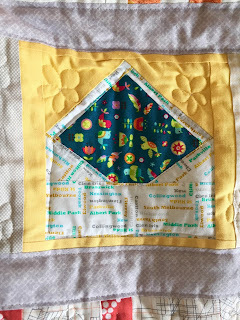 I love all the personal touches from your quilting, which, by the way, looks great! Such a wonderful quilt Susan! It's fabulous. I LOVE it!!! It turned out so well. Looks wonderful - I can only do quilting with variations on straight lines, so I'm impressed. 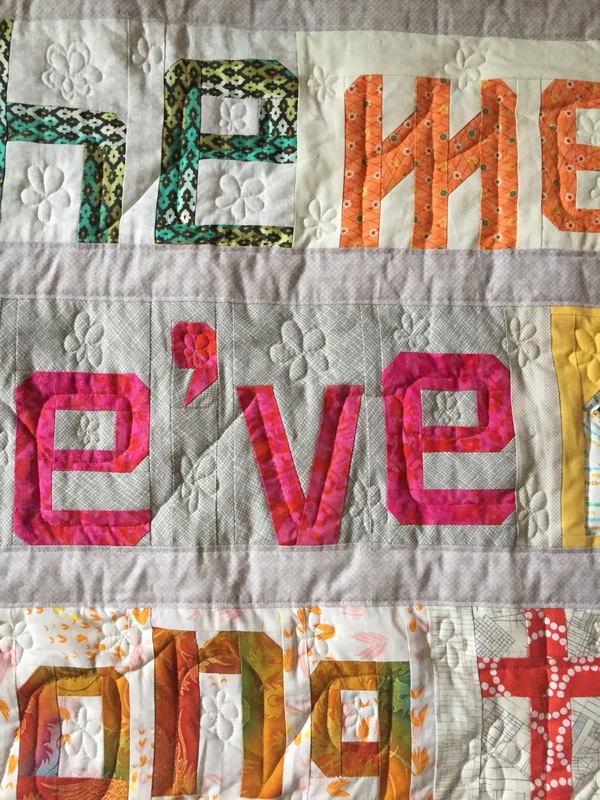 How big did your quilt end up, did you allocate a word or two to everyone? Turned out such a great quilt! I love your quilting - I don't know why you are so hard on yourself. The flowers are fantastic! I just have the biggest smile on my face right now, enjoying all the photos of this terrific quilt and quilting. I love all the flourishes and special touches, as I think this quilt can take a lot of that. The sentiment is so lovely, and I love seeing your finished project! Thank you for such a satisfying few minutes at the computer--bravo to you! Wow!!! This is wonderful and such a nice sentiment too. A quilt I'm sure you'll cherish for the quote and all the blocks made by quilty friends. I really like how you quilted through the letters kind of like cursive. I didn't join this bee but then ended up asking for letter blocks when my turn came in the Mid Century Bee so one day Ill have a word quilt too. No immediate plans though so it will be awhile. ... and the wonderful quilts we make along the way. 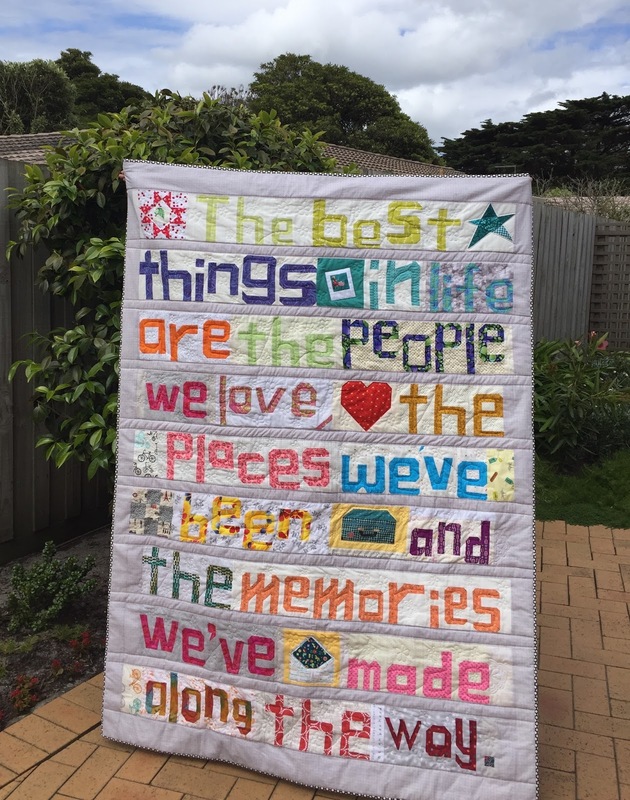 This quilt will signify so many memories simply from it's own journey... great finish! This quilt is so amazing! I love the saying - it is so true! The little picture blocks fit in so well. The quilted flowers are perfect to me! What a wonderful finish!